Source: CICH graphic created using data adapted from the Survey of Young Canadians 2010/2011, Statistics Canada- custom runs. In 2010/11, almost 9% of children under 6 lived in neighbourhoods that their parents felt had low levels of neighbourhood cohesion1. That proportion varied from 11% in Québec to 4% in Newfoundland & Labrador. 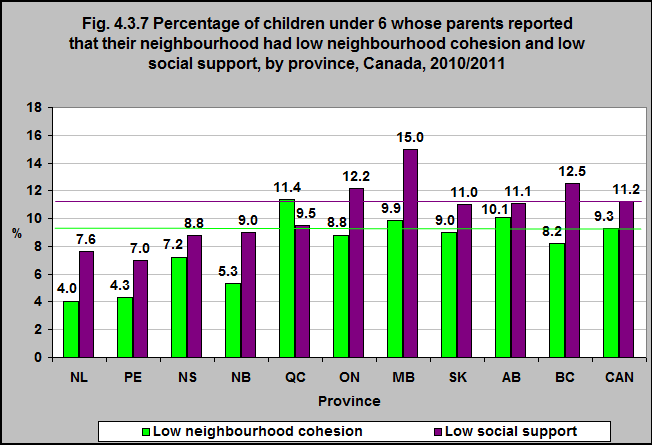 In 2010/11, 11% of children under 6 lived in neighbourhoods that their parents felt had low levels of social support. That proportion varied across the provinces from 15% of children in Manitoba to only 7% for those in Prince Edward Island.